Looking at the beginning of my new project: a blues/southern rock band, I was looking forward to playing my "long forgotten" Les Paul. But I had been playing my Tele for so long that I quickly realized that the thin neck on the LP did not suit me at all. 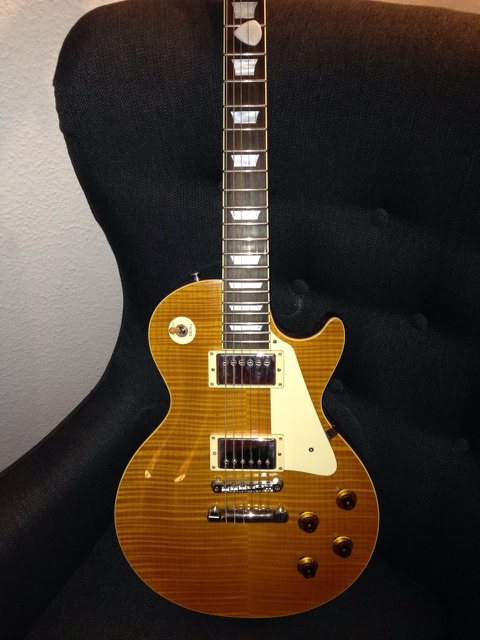 So stumbling over a sales ad of a second hand Tokai Reborn Old 2010 with a fatter neck came at just the right time. I received it today, and after only 2 minutes of playing it I decided that my Gibson had to go! The Tokai plays soooo sweet. The neck fits me perfectly and the pickups makes my Katana sing like I haven't heard it sing before! Color is lemon drop but the picture doesn't convey its beauty. Hoping to get better pictures tomorrow in daylight. Looks gorgeous, wish you well, Jesper. Like the sound of the new project. Thank you David and Barend. It's a great guitar and definately a step up. That's a Beaut! Let's hear what it sounds like. Recording will come in due time. Nice piece of kit and I’m not really surprised that you are going to drop the Gibson; Tokai LP’s are superb - I never got down to getting one but if Robert Fripp and Billy Gibbons saw it fit to get Tokai it says a lot in their favour! Always heard good things about Tokais. And Gibbons is one I am studying atm, I have always been a fan and now I feel I have the skills to make a decent try.